Nestled on 40 acres overlooking Table Rock Lake, White River Lodge Bed & Breakfast is a log cabin-style inn that offers a rustic mountain getaway near Branson in Missouri’s Ozark Mountains. Constructed from handcrafted logs, the cozy bed and breakfast feature four well-appointed timber-clad rooms with wooden furnishings, bathrooms with whirlpool tubs or jetted showers, gas fireplaces, and gorgeous lake views. A deluxe suite features a sleeper sofa for extra guests and a hot tub, and a full breakfast is served in the dining room every morning. The lodge features a cozily furnished great room with a massive fireplace, an airy sunroom, and a covered patio where guests can relax, a guest kitchen stocked with complimentary drinks, snacks and desserts, and a fitness room with and sauna. Recreational activities at the lodge and in the surrounding area include hiking, mountain biking, world-class trout fishing and boating on Table Rock Lake, horseback riding, and golf. 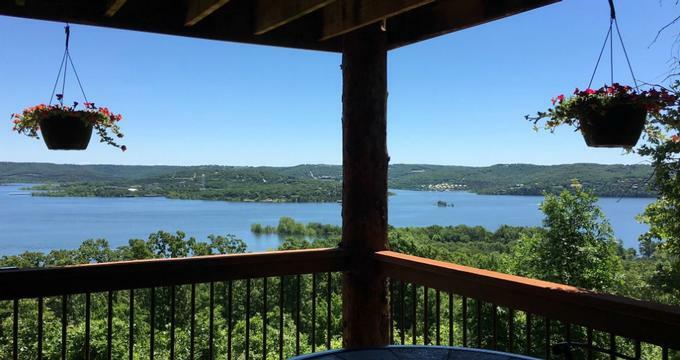 The White River Lodge Bed & Breakfast features four beautifully appointed guest rooms and one two-bedroom suite, all of which boast gorgeous views over Table Rock Lake. All accommodations have king or queen-size beds with luxury Comphy brand linens, en-suite bathrooms with slate floors, log vanities with granite tops, walk-in showers, jetted tub/showers, plush towels, bathrobes, and slippers, and branded toiletries, and private patios with table and chairs. In-room conveniences include LG 42? HD TVs with DirecTV satellite programs, Blu-Ray/DVD players, iPod/iPhone 3G clock radios, gas-flamed fireplaces, hairdryers, and complimentary wireless Internet. Located on the upper floor of the lodge with stunning Table Rock Lake views, Couple’s Cove is 400 square feet in size and features vaulted ceilings, wooden floors, and a handmade, twisted-cedar king bed dressed in luxury Comphy brand linens. An en-suite bathroom with slate floors, a glass-enclosed shower, a wood log vanity with granite tops, plush towels, bathrobes and slippers, and branded toiletries and a comfortable living space has a gas fireplace, a Jacuzzi tub for two, and a private patio with table and chairs. The Foggy River Room is located on the main level and offers 400 square feet of space with a king-sized log cedar bed dressed in luxury Comphy brand linens and an en-suite bathroom with a glass-enclosed shower, a wood log vanity with granite tops, plush towels, bathrobes and slippers, and branded toiletries. A sunny living room has a cedar love seat, a two-person Jacuzzi tub, a gas-flamed fireplace, and a private patio with table and chairs and beautiful lake views. Located on the top floor of the lodge, the Long Creek Room is 375 square feet and features a spacious living area with double glass patio doors that open onto a private deck with wicker deck furniture. The Room has a handmade, cedar log king-sized bed dressed in luxury Comphy brand linens and an en-suite bathroom with slate floors, a glass-enclosed shower, a wood log vanity with granite tops, a wall-mounted hairdryer, plush towels, bathrobes, and slippers, and branded toiletries. A spacious living area has a loveseat sofa, a log rocking chair, handmade oak/hickory chairs, a two-person Jacuzzi tub, a gas-flamed fireplace, and modern amenities. Lakeshore offers 375 square feet of space and has two queen-sized log beds dressed in luxury Comphy brand linens and an en-suite bathroom with slate floors, a glass-enclosed shower, a wood log vanity with granite tops, a wall-mounted hairdryer, plush towels, bathrobes, and slippers, and branded toiletries. Ideal for families and friends, the room has a spacious living area with a two-person Jacuzzi tub, a gas-flamed fireplace, and a private patio with tables, chairs, and an umbrella. The Pond Suite is a versatile, two-bedroom suite with a private entrance and parking driveway. The Suite boasts 775 square feet of space and is ideal for families and groups of friends looking for extra levels of privacy and seclusion. The Pond’s master suite has a king-sized bed dressed in luxury Comphy brand linens, and the second bedroom has a queen-sized bed. A shared bathroom with slate floors, a glass-enclosed shower, a wood log vanity with granite tops, a wall-mounted hairdryer, plush towels, bathrobes and slippers, and branded toiletries. A spacious living room offers a queen-sized sleeper sofa, a loveseat and chair with an ottoman, dining table and chairs, a gas-flamed fireplace, and opens onto the private patio with a Lazy Boy Hot Tub and outdoor patio furniture. A complimentary gourmet breakfast is served every morning and includes granola, cereals, yogurt, fresh fruit, farm-fresh eggs and egg dishes, breakfast meats, and a variety of signature dishes, along with freshly brewed coffee, tea and fruit juices. A guest kitchen is fully stocked with complimentary snacks and drinks that are available throughout the day, as well as a refrigerator, stove, microwave, and sink. The White River Lodge Bed & Breakfast features an array of amenities and facilities for guests to enjoy, including an elegant Great Room with a massive free-standing, wood-burning stone fireplace and comfortable sofas and armchairs, and a glass-enclosed sun-room with patio doors that opens onto an outdoor deck with chairs, tables, umbrellas, and breathtaking views. A relaxing, lake-view log dining area has a bar that serves soft drinks and coffee, and a state-of-the-art theater room boasts comfy lounge seating and a gas-flamed fireplace for evening entertainment. A fully equipped fitness and games room offer various cardio machines, a sauna, billiards ping pong, and darts, and a covered, outdoor patio have a wood-burning fireplace, gas barbecue grill, Lazy Boy 58-jet spa, picnic tables and chairs, and serene lake views. There is a guest computer with Internet access and printing and copying services, a gift shop that sells vacation essentials and other goodies, and a guest kitchen is stocked with complimentary drinks and snacks.